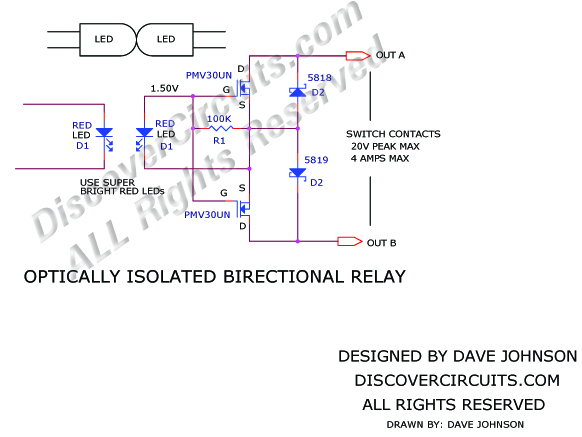 Circuit: #374BiDirectional Solid State Relay __ Circuit designed by David A. Johnson, P.E. The circuit below can switch up to 4 Amps of current with a peak voltage up to 20v. It is fully isolated using two inexpensive red LEDs. One LED forms a red light source, which illuminates a second red LED. The circuit takes advantage of the 1.5v produced by super bright red LEDs when illuminated with red light. The voltage produced by one red is routed to two n-channel FETs, configured in a bi-directional switch circuit. The two FETs selected have a low gate-source threshold voltage, which allows them to turn on hard from the 1.5v from the red LED. The bi-directional configuration allows the circuit to switch both AC and DC power. Using quality super bright red LEDs, the circuit will switch on fully with only 5ma of LED current.